Wash and soak the rice for 10 minutes. Now boil the rice until each grain of the cooked rice is separate yet soft. Strain and set aside. Stew the chopped pineapple by cooking in very little water and 2 teaspoons of sugar for 10 minutes. For the gravy, grind the tomatoes, chillies and ginger. Set aside. Heat the butter in a pan and add the cumin seeds. As they splutter, add the pav bhaji masala and the chopped capsicum and saute for 2 minutes. Add the chilli powder, turmeric powder and tomato gravy and cook until the butter separates. This should take about 10 minutes. Now add the stewed pineapples and allow to cook for 5 more minutes. Add salt and cooked rice and gently mix everything together. Garnish with chopped coriander and halved grapes and serve hot. You can substitute pineapples with oranges in this fruit pulav. The orange segments don’t need to be stewed. They can be added along with 1-2 teaspoons of sugar once the tomato gravy is cooked. Garnish with fresh pomegranate instead of grapes. Enjoy adding chopped onions right in the beginning along with the capsicum for enhancing the flavours. Quick version of this recipe: For those of you who make pav bhaji, prepare double the quantity of gravy. Once the gravy is done, remove half in another pan, cook along with stewed or tinned pineapple and a dash of sugar. Mix along with cooked rice and wow – the dish is ready! This recipe was first published in His ladle love – a column in Harmony Magazine. 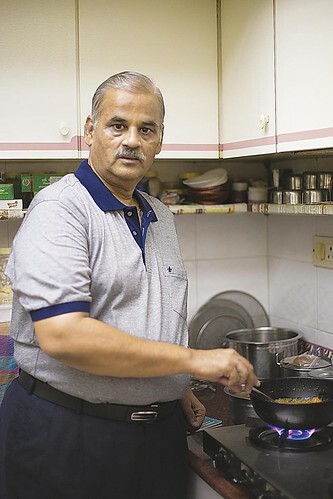 Part-1 of this post is an interview with Gautam Seth, a Rajasthani from Jaipur, now residing in Mumbai, and truly a passionate foodie for all seasons!